Greg / May 20, 2015 / Comments are off for this post. As some people may be aware, May is “National Asthma and Allergies Awareness Month”. This is most likely because May is also the peak season for allergy and asthma sufferers. Having suffered from asthma as a child growing up, I am fully aware of what molds and activities may trigger an asthma attack for me, as I’m sure most asthma sufferers are. However, many people may be unaware that the products and methods used to clean their home could also be key contributors to some allergic and/or asthmatic issues they may have. For example, many people may not be aware that fumes from some cleaning products may induce asthma in otherwise healthy individuals. A large and growing body of evidence links frequent use of many ordinary cleaning supplies at home or on the job with development of asthma and other respiratory problems. It is already known that traditional cleaning product fumes may trigger attacks in people previously diagnosed with asthma. If you or a family member suffer from allergies or asthma, a good defense is air quality. And, while you may not be able to control the air quality outside of your home, you can certainly do something to improve it inside. The first step to higher air quality may be as simple as switching from a traditional cleaner to a greener alternative. If you happen to use a cleaning service, make sure they use Green Seal certified cleaning products, as Clean Conscience does. Greg / May 15, 2015 / Comments are off for this post. This time time of year, many people have their windows open to let in the sweet smells and comfy breezes Spring has to offer. Unfortunately, along with those smells and breezes, a number of allergens seem to make their way into the home as well. Pollen from trees and dust and dirt from freshly cut lawns, overtime can sneak in through window screens and settle on window sills, furniture, and floors; causing allergies for many people. The solution to this problem is a thorough cleaning. However, what you clean isn’t the whole answer, how you clean it can be just as important. Here are a few tips on how to rid your home of allergens this spring. “Dusting”- When it comes to dusting, try to use microfiber cloths instead of cotton cloths. Cotton cloths can actually spread particles on surfaces and send them back into the air. Microfiber cloths do a much better job of trapping the dust and other allergens on hard surfaces. “Vacuuming”- The best kind of vacuums to use for people who suffer from allergies, are vacuums with a HEPA filter. These filters prevent smaller particles from blowing back out. “Mold”- Sometimes it’s not the dust or pollen in the air that causes allergies, but the moisture. Moisture can cause bathroom mold to form. Besides just looking gross, bathroom mold can also cause allergies. The best natural solution for this kind of mold is a combination of water and borax. Greg / May 12, 2015 / Comments are off for this post. When it comes to cleaning up the house, many people still reach for whatever chemical cleaner is sitting under their sink and just spray away,sometimes using several different traditional cleaners for very similar jobs, not realizing that there are plenty of safe and natural cleaning supplies already in their home. In fact, with just a few simple ingredients, which can be found in most homes, you can tackle a plethora of cleaning tasks. In this article from BLOGS.NaturalNews, they discuss 14 easy green cleaning tips that will assist you in getting your home clean without the need for any chemical-laden traditional cleaners. Harsh cleaners are commonly chosen to get house cleaning done. Most people are used to using bleach and other harsh chemicals because they feel that that is the only way to get the job done right. They don’t even realize there are healthier ways to get your house clean that won’t put toxic pollutants in the air while still getting great results. You can easily keep your space clean and sanitary the green way with vinegar, salt, lemon juice, baking soda and a few other ingredients found around your house. Here is a look at 14 easy, green cleaning tricks for the whole house. Most window cleaners are made with ammonia but you can actually clean them effectively using a half gallon of water and 4 tablespoons of lemon juice mixed together. Use a lint-free rag, cloth diaper, old cotton t-shirt or a microfiber cloth to get the best results. Avoid using paper towels, regular rags that leave lint or newspapers that will leave a mess. You can also clean mirrors with vinegar and water mixtures. Polish for wood, metal and other surfaces are made with some of the most poisonous chemicals. Polish is made with petroleum distillates and solvents which are hazardous. Instead, try a mixture of 2 parts olive oil, 1 part lemon juice and apply it to your wooden furniture with a soft cloth. If that’s too oily, Care2 says you should reverse the formula to use more vinegar or lemon juice and less oil. It’ll shine and smell great. Of course, always test a small area first as you would with any of your traditional cleaners. For the showers in your home, mix baking soda and all-natural dish soap to remove soap scum from shower doors. Clean the tub by letting vinegar or lemon juice and hot tap water soak for a while before scrubbing with a brush. Use a spray bottle filled with white vinegar and water to clean the shower curtain, which will also help deter the growth of mold (turn on fans when showering to suction the steam and moisture out of the air too). Synergy Maids recommends cleaning the toilet and sink with vinegar and baking soda rather than bleach and then mop the floor with vinegar. For the kitchen, you’ll want to wipe the faucet with a cotton ball soaked in rubbing alcohol to make it sparkle. If you have granite counter tops, wipe off the grease and debris with a dishcloth dipped in warm water and mild dish soap. To disinfect and shine, take a mixture of half rubbing alcohol and half tap water and wipe it clean (Make sure your granite has a good seal) . For sticky messes, use a drop of lemon essential oil with a cotton ball or rub with a lemon rind. For your pots and pans, cut a lemon in half, spray it with water, sprinkle with salt and then scrub with the lemon. This is a safer and very effective way to clean. If you have grease on the stove, try baking soda which will also work on counter tops. Stainless steel sinks will clean well with baking soda and a damp sponge. 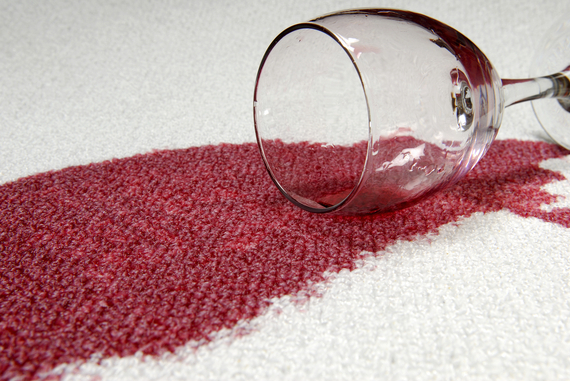 For vinyl floors, simply dip your cloth into lemon juice and rub it on stained areas. For carpets, make sure you vacuum thoroughly and then clean the carpets with a steam cleaner. If it’s just spots, spray with a vinegar and water mix, place a damp cloth on it and let a clothes iron sit on it for a few minutes at a time until it comes up. You can also mix salt, borax and white vinegar to place on stained areas before vacuuming. Metal work that needs attention can be cleaned the green way as well. Most metal polishes for brass, copper, chrome and stainless steel contain ammonia and acid. Clean copper and brass the green way using salt, vinegar and flour. Make a paste with the three ingredients, rub it onto the item with a soft cloth, let it dry out for an hour and then wipe it off with a clean cloth. When you’re ready to clean your home in a healthier way, try these easy green cleaning tips to get the job done effectively without allowing toxic chemicals to get into the air you breathe.